Cool island breeze greets you from our Murcott Villa apartment which sits on top of a hill overlooking Bay Street & The Atlantis from the mainland. An ideal location within walking distance of downtown, the tourist district, and both hospitals.Relax and take a dip in the pool or enjoy the quiet space of well manicured grounds. 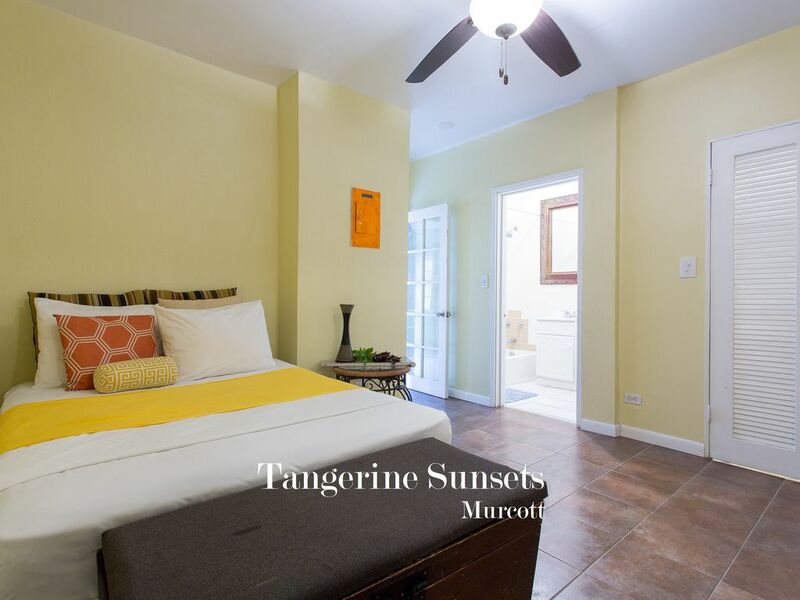 If you're looking for convenient access to downtown, the bus stop, the famous yoga retreat on Paradise Island or the equally famous Bahamas Food & Foot Tour, then you've come to the right place. You're wonderful vacation starts here. Features 1 Full bed and one Air-Bed (queen) to accommodate 4 guests. Stayed in this place for a month. The space was great and equipped with everything we needed, including kitchen and bathroom essentials. Because the rental is located near a quiet area downtown, grocery and convenient stores are not so close as they would be in more residential areas. There is a small store a quick 5-minute walk that you can find most items except produce. The nearest beaches are about a 20-25 minutes walk and downtown is 15-20 minute walk. A car is recommended if you like to get up and go and cannot afford to walk and appreciate nature, but not necessary. The property staff left names and numbers of local taxi services that were useful during our stay. The property staff was exceptional and available if we had any questions. Bree, we're thrilled you enjoyed your stay and for your kind words and feedback. We enjoyed hosting you and thank you for taking care of our place during your stay. I'm glad you found our team and the information we provided useful during your stay and look forward to seeing you the next time you're in town. :) Glad to see your a Saxon's fan Rob. Thanks so much for your kind words and choosing to stay with us. We enjoyed hosting you and look forward to the opportunity to do so in future. Communication was a breeze as the place has a property management company taken care of it. We were also able to set up a taxi from the airport through them which was helpful. Additionally, they called to make sure we arrived. Because an unexpected issue arose on the weekend I actually called the owner and he was more than willing and helpful to resolve the issue! He called the plumber and it was taken care of in a timely fashion. Location is always a selling point but it depends on your needs. For us, it was perfect as we were doing a rotation at Doctor's Hospital and we were just a 4 minute walk from work! I believe I walked more than Forest Gump ran while I was there and never felt unsafe. We stayed a month so I believe you can take my word. Regardless of where you stay, locals recommend you do not walk around at night so we just walked before sunset and taxied back home every night. A local grocery store is an easy 8 minute stroll from the house, however it might not have all you need. It covers almost all the bases except fruits and veggies so I also made a trip to another grocery store which is about a 20 minute walk. The downtown stroll is 20-25 minutes depending on which area you are going. There is no need to be fancy here because you will sweat everywhere you go. The closest beach is just beyond downtown and will take 25-30 minutes on foot. I do not need much in life to stay happy so I enjoyed The Bahamas. Walking everywhere or taking the local bus was a nice feeling. As far as inside the house I would say it is has all the basic accommodations that you need. We added some kitchen ware, you're welcome! Myself and classmate rotated every week between the bed and the couch bed. If this is your scenario as well be warned that when you get the privilege of sleeping on the couch bed you are going to sweat. We also bought a fan so once again, you're welcome! The A/C is in the bedroom and can turn the bedroom into Alaska weather but the living room is more like a afternoon in Texas. So if you are a couple or you only need to sleep in the bedroom it is perfect. I am a trooper so I managed my glorious two weeks on the couch bed. All in all, my month in the Bahamas was wonderful. Oh, I almost forgot laundry is on site and cost $1.50 for wash and $1.50 for dry. Overall, Duran's place covered the most important areas for my month stay! Thanks so much for staying with us and taking the time to leave a review. We were happy to host you and it was great communicating with you. I'm glad you enjoyed your stay and your time in our Murcott property. We look forward to seeing you on your next visit.